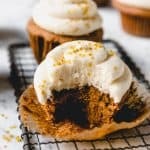 These moist Gingerbread Cupcakes with eggnog buttercream frosting are made from scratch and the perfect handheld non-cookie treat for your holiday party this year! Made with molasses, ginger, cinnamon, and other spices, these cupcakes taste just like Christmas. Preheat the oven to 350 degrees F and line a muffin pan with cupcake liners. In a stand mixer, beat butter and brown sugar on medium speed using a paddle attachment until light and creamy, about 2 minutes. Add the egg, milk, molasses, and vanilla, mixing well and scraping down the sides and bottom of the bowl with a rubber spatula. Don't worry if the ingredients don't totally combine - they will finish coming together with the addition of the dry ingredients in the next step. Add the flour, baking powder, baking soda, salt, ginger, cinnamon, nutmeg, and allspice, mixing on low speed just until combined and making to sure scrape the bottom and sides of the bowl again. Fill cupcake liners 2/3 full. Bake for 19-21 minutes, until a toothpick comes out with just a few crumbs when inserted into the center of a cupcake, then cool completely before frosting.